Posting your car for sale online is easy to do. There are a multitude of places to post and many interested buyers are scouring the internet for their next car. In order to attract the most amount of attention to your car, you should have pictures of the vehicle attached to your posting, or available upon request. 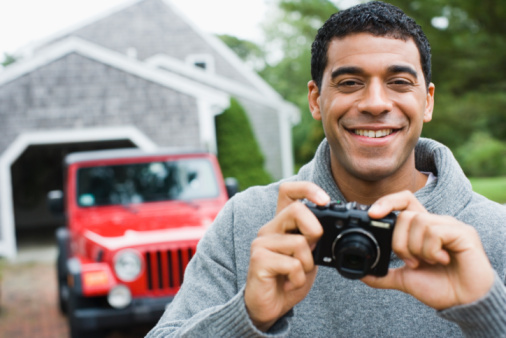 Taking photographs of your car in the proper way can help boost interest and increase the chance that someone will be interested in the car enough to take it for a test drive. Use a newer camera. This goes for smart phones, too. If you’re using a five-year-old phone or camera or smart phone, chances are that your pictures will come out grainy. Opt for a newer camera with higher pixels than the older models. A clear, colorful picture will go a long way to showing off the awesome angles of your car. Get different angles. Buyers might want to see your entire car before deciding whether or not that they’d like to take it for a test drive. Get all the exterior angles (front, both sides, back). Show off any distinct characteristics of your car, like a really sweet sound system, or any imperfections, like large paint chips. It’s always better to be up-front about imperfections! Use the right lighting. This doesn’t mean that you should invest in professional lighting tools to photograph your car. Just make sure there is sufficient light to highlight the color of your car. You can also photograph the car during the “golden hour” that occurs the hour after sunrise or the hour before sunset to give your car the best natural lighting possible. Also, pay attention to the background of your photograph. Make sure there are no distracting elements, like your grandma attempting a photobomb, to your photograph that can divert attention away from your vehicle. If you find a new owner for your vehicle, you can transfer the title easily at MVD Express. We’ll help you take care of the title transfer to get you in, done and on your way in no time at all. Stop into any MVD Express location, or schedule an express solutions appointment today! We’ll see you soon.